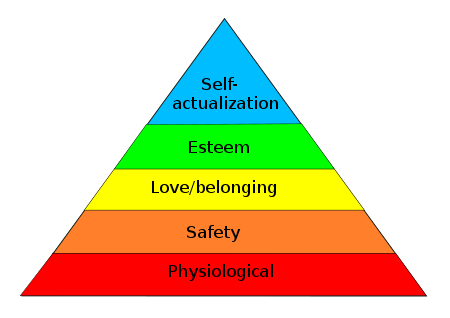 It has become painfully obvious that we generally express our views on right and wrong from within the context of our unspoken internal perception of our stance within Maslow’s Hierarchy of Needs. We think and act primarily to satisfy and protect our ability to satisfy the needs at (and below if appropriate) the level we are confident we are at. We can dedicate significant personal resources to “self actualization” only if we are confident all the lower levels are being consistently met by our position and other efforts. Many will snort, “But that’s obvious.” And it is. Except that much of the “leadership” of the Co-operative and Commons movements are clearly acting from personal positions of having satisfied most of their lower-level needs such that they can adopt the posture of “self-actualization” in act and deed. We see this “all the time”1 in the academic and theoretical writings about co-operation, commons (communing), peer production, and solidarity economics. Unconsciously, many of us bring this confidence in our degree of needs-satisfaction as a to our thinking and writing on these topics. We overlook the importance to those we most want to help of their unsatisfied needs which represent serious challenges to their ability to enlist in activities related to satisfying higher level aspirations. Quite often, they can’t get past the need to get shelter, food, or esteem in the community to tackle problems like the creation of a Post-Capitalist future system for global society … or even the potentials available in a regional federation of co-operative (commons, in European usage these days it seems). Yes, I generally think in “self actualizing” terms on these matters. It is a privileged position and tends to make me somewhat abstract and seemingly pompous in my judgements when in company with those who identify as being impoverished or the subject of discrimination and/or exploitation. Interactions with and among the GEO Collective members is a constant reminder and corrective. So are experiences like participation in GEO’s recent “Advancing the Development of Worker Co-operative” (ADWC) conference. I am constantly humbled by the enormous task of getting all of our deserving (all of our) populations needs met to the point that the more primordial no longer dominate this or that group or locale. Then we could have all the lovely intellectual fun of redesigning the political, economic, and social structure of our global community.